It’s Henri, it’s Halloween and Bonfire season, it’s time for that Existentialist cat again. Parfait. Tonight is Fireworks night here in the UK. We light fireworks, set off mini explosions and make giant bonfires to celebrate a historical attempt to blow up the Houses of Parliament and kill the King, James I, They caught the perpetrators including one Guy Fawkes who was sentenced to a gory death and who is remembered or forgotten when all those effigies called guys are burnt on November the 5th every year. Nowhere in Britain makes a bigger deal of this than my home town of Lewes that is already in the grips of excitement getting ready for its great moment of distinction tonight, the annual Lewes Bonfire, the biggest firework night in Europe, scheduled to bring tens of thousands of visitors to our streets. It remembers Guy Fawkes of course but also 17 Protestant martyrs burnt outside Lewes town hall during the reign of Queen Mary I – the girl the vodka and tomato juice drink is named after, Bloody Mary. It should be good anarchist fun when our streets are taken over by rowdy and disrespectful processions and the effigy burning of this year’s favourite bad guys. I shall try to bring you some flavour of it in tomorrow’s blog if I’m not having too much fun that is to take any pictures. I thought, though, I wouldn’t let this time of year pass without drawing your attention to an Existentialist view of another Autumn celebration. 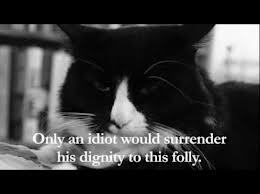 There is a new (4th) episode in the wonderful Henri Le Chat movies starring the World’s most sophisticated Existentialist cat. If you’ve missed the previous three episodes then make up for lost time and for missed and mixed joy. Here is Episode Four taking an Existentialist view on Halloween. I don’t think Henri would like Lewes’ Bonfire party. To see the other three Henri films, type “Henri” in this blog’s search window above.